The WordPress range slider field allows users to drag a handle to select a number from a defined range of numbers. 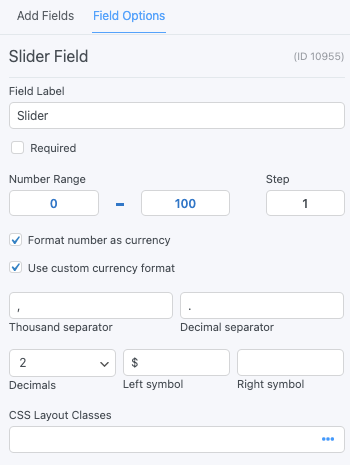 In addition to the standard field options, a number slider field has a few field-specific options. Set the number range for your slider field. A minimum number of 0, maximum number of 100 and step number of 1 is set by default. 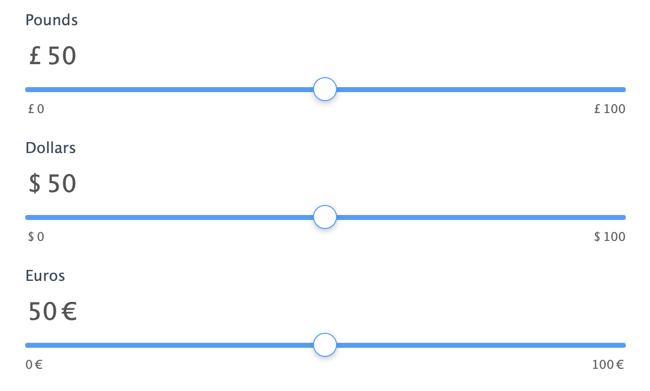 Some range slider styling is available in Formidable → Styles → Edit Styles → Slider Fields. To learn more about styling your form, see the visual form styler page. You can display the range slider field value in a form's confirmation message, email, or View. Display value: Display the value submitted in a slider field. Replace x with the ID or key of the slider field. In Formidable → Styles → Custom CSS, add the following example to allow you to add a currency symbol for each of your range slider fields. Change 251, 252, 253 to the field ID and change £, &dollar;, € to your preferred currency.